An AC combination fuel and vacuum pump is used on all engines. The pump assembly is mounted on the right side of engine crankcase at the front, and is operated by an eccentric on the engine camshaft which actuates the pump rocker arm. The 1952 Buick fuel and vacuum sections form two separate, independently operated diaphragm type pumps, which are combined in one compact unit. The single rocker arm actuates both the 1952 Buick fuel and the vacuum sections through separate links which permit each section to function independently. See figure 3-13. A Type DG pump is used on Series 40-50 engines and a Type DH pump is used on Series 70 engines. The vacuum sections of both type pumps are identical. In the 1952 Buick fuel section of the Type DG pump the valves are staked in place, and the inlet filter screen is housed in a small well which is closed by a plug and gasket. See figure 3-13. In the fuel section of the Type DH pump, the valves are secured by a retainer and screw, and the inlet filter screen is housed in a removable metal bowl. The DH pump also has an air dome mounted in the fuel outlet passage. The fuel section of the pump draws gasoline from the tank and supplies it to the carburetor in sufficient quantity to meet engine requirements under all operating conditions. 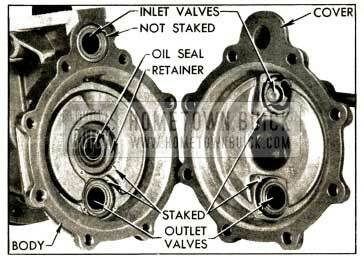 The principle parts of the 1952 Buick fuel section are shown in figure 3-13. The rocker arm spring and the link spacer hold the rocker arm in constant contact with the eccentric on the engine camshaft so that the rocker arm swings up and down as the camshaft rotates. As the arm swings downward it bears against a shoulder on the fuel link which is pivoted on the rocker arm bushing. The fuel link swings upward, thereby pulling the 1952 Buick fuel diaphragm upward by means of the connecting pull rod. Upward movement of the fuel diaphragm compresses the diaphragm spring and also creates a vacuum in the fuel chamber below the diaphragm. The vacuum causes the outlet valve to close and causes fuel from the gasoline tank to enter the fuel chamber through the inlet valve. As the rotating eccentric permits the rocker arm to swing upward the arm releases the fuel link; it cannot move the link downward. The compressed diaphragm spring then exerts pressure on the diaphragm and the fuel in the chamber below diaphragm. 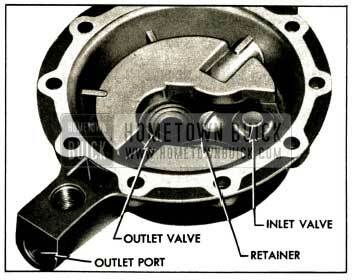 This pressure closes the inlet valve and forces fuel out through the outlet valve to the carburetor. 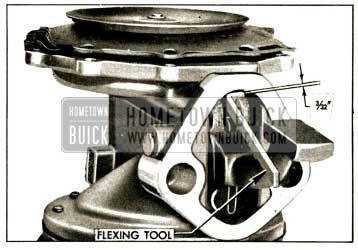 Since the 1952 Buick fuel diaphragm is moved downward only by the diaphragm spring, the pump delivers fuel to the carburetor only when the pressure in the outlet line is less than the pressure maintained by the diaphragm spring. This condition arises when the carburetor float needle valve is not seated and the fuel passage from the pump into the carburetor float chamber is open. When the needle valve is closed and held in place by the pressure of the fuel on the float, the pump builds up pressure in fuel chamber until it overcomes the pressure of the diaphragm spring. This pressure results in almost complete stoppage of diaphragm movement until more fuel is needed. Normal diaphragm stroke is approximately 1/64″. The air dome used on the Type DH (Series 70) pump provides a pocket in which fuel under pressure can compress a certain volume of air. When the pressure is relieved (pump on suction stroke) the pocket of compressed air pushes the fuel on to its destination. The air dome minimizes flow variations experienced with a two-cycle pump stroke and increases the pump output. The vacuum section of the pump acts as a booster when engine manifold vacuum is insufficient to operate the windshield wipers at proper speed. This section is a double acting pump since it is effective on both the upward and downward movement of the diaphragm. The principle parts are shown in figure 3-13. As previously explained (subpar. b), the rocker arm swings up and down as the engine camshaft rotates. As the arm springs downward it bears against shoulders on the two vacuum links which are pivoted on the rocker arm bushing. The vacuum links swing upward, thereby pushing the vacuum diaphragm upward by means of the connecting rod. 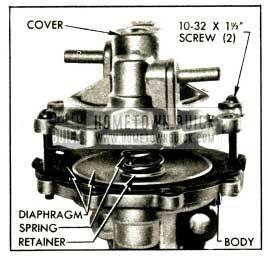 Upward movement of the diaphragm compresses the diaphragm spring, which then pushes the diaphragm downward as the rotating camshaft eccentric permits the rocker arm to swing upward. The rocker arm cannot move the vacuum links downward. Upward and downward movement of the diaphragm produces a pumping action in the air chambers on both sides of the diaphragm. When the windshield wiper control valve is opened and the diaphragm is moved upward by the rocker arm and links, air is drawn through the windshield wiper motor into the lower air chamber through the inlet valve in pump body. At the same time, air is exhausted from the upper air chamber into the engine manifold through the outlet valve in the vacuum cover. As the spring moves the diaphragm downward, iris drawn into the upper air chamber through the inlet valve in the cover, while air is exhausted from the lower chamber through the outlet valve which opens into the pump body. Holes in pump body permits this air to escape to atmosphere. When the windshield wiper control valve is closed, or when engine manifold vacuum is sufficient to operate the wiper motor, vacuum holds the diaphragm in the upward position so that the rocker arm cannot actuate the vacuum links. 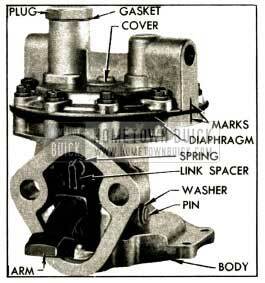 The vacuum pump remains inactive until low manifold vacuum permits the diaphragm spring to push the diaphragm down. Inspect for leaks at 1952 Buick fuel pump diaphragm flange. Tighten the cover screws alternately and securely. Do not use shellac or any other adhesive on diaphragm. Clean the filter screen in fuel pump and gasoline filter at carburetor. Disconnect pump-to-carburetor pipe. Ground primary terminal of distributor with jumper wire so that engine can be cranked without firing. Place suitable container at end of pipe and crank engine a few revolutions. If no gasoline, or only a little, flows from pipe the feed pipes are clogged or fuel pump is inoperative. Before condemning the 1952 Buick fuel pump, disconnect feed pipes at pump and blow through them with air hose to make sure that pipes are clear. If gasoline flows in good volume from pipe at carburetor it may be assumed that the 1952 Buick fuel pump and feed pipes are okay; however, it is advisable to make the following “static pressure” test to make certain that 1952 Buick fuel pump is operating within specified pressure limits. 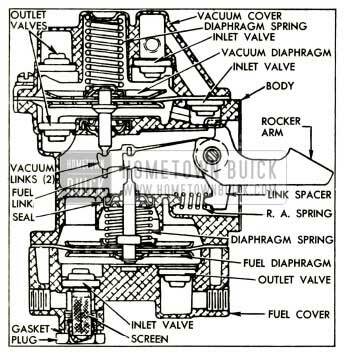 If 1952 Buick fuel pump is operating properly the pressure will be 4 to 5 pounds and will remain constant at speeds between 450 and 1000 rpm. If pressure is too low or too high, or varies materially at different speeds, the pump should be removed for repairs (par. 3-17). NOTE: If pressure gauge is connected at pump outlet instead of at end of feed pipe the pressure should be 4 1/2 to 5 1/2 pounds. Make certain that wiper hoses are properly connected at pump, wiper motor, and control on instrument panel, and that connections are air tight. Replace cracked or deteriorated hose. On Series 40 make certain that wiper transmission links are not binding against other parts under the cowl. On Series 50-70, check windshield wiper transmission cables to make sure they are correctly attached to wiper motor, are properly located in pulleys on wiper transmissions and cable tensioners, and are not rubbing against anything under the cowl. A further test of vacuum pump may be made by attaching a vacuum gauge to the inlet port (port connected to wiper motor), with outlet pipe disconnected. CAUTION: Always make this test of vacuum pump with the outlet open. After removal of pump from engine and before disassembly is started, plug all openings and thoroughly wash exterior of pump with cleaning solvent to remove all dirt and grease. Replace two diametrically opposite vacuum cover screws with 10-32 x 1 1/2″ screws and turn them down snug. Remove all other cover screws, then alternately loosen the 1 1/2″ screws until pressure of diaphragm spring against cover is fully released. See figure 3-14. Remove vacuum cover, diaphragm spring, and spring retainer. Tilt the vacuum diaphragm very slightly toward body mounting flange and rotate it to unhook the pull rod from the vacuum links, then remove diaphragm from pump body. Cut off the burrs produced by staking, then remove all valves from cover and body by prying out with a screwdriver or hook-shaped tool. The valve adjacent to body mounting flange is not staked in place. See figure 3-18. If only the vacuum section of pump is to be repaired, inspect parts as specified in subparagraph d and reassemble pump as described in subparagraph g; otherwise, proceed with subparagraph b. NOTE: The vacuum cover must be removed (subpar. a) before removing the 1952 Buick fuel cover. On Type DG (Series 40-50) pump, remove plug, gasket and 1952 Buick fuel screen from fuel cover. On Type DH (Series 70) pump, remove bowl screw and gasket, bowl and gasket, and fuel screen from fuel cover. Mark edges of fuel cover and pump body with file so that cover may be reinstalled in its original position on body. See figure 3-15. Remove all fuel cover screws and separate the cover from pump body. If cover sticks to body, rap with soft mallet-do not pry between the parts with a screwdriver. Tilt fuel cover very slightly toward body mounting flange and rotate it to unhook the pull rod from the fuel link, then remove diaphragm from pump body. On Type DG (Series 40-50) pump, cut off the staked valve retaining burrs, then remove valves from fuel cover by prying out with a screwdriver or hook-shaped tool. On Type DH (Series 70) pump, remove valves which are held in fuel cover by a retainer and screw. See figure 3-17. If the pump has been in service for high mileage it is advisable to remove the rocker arm and links for inspection (subpar. c); otherwise inspect parts as specified in subparagraph d and reassemble pump as described in subparagraphs f and g.
File riveted end of rocker arm pin flush with steel washer (fig. 3-15), or cut off end with a 5/8″ drill, then drive out pin with a drift punch and hammer. 2 Remove rocker arm and links, and rocker arm spring from pump body. Remove bushing which holds rocker arm and links together. Clean and rinse all metal parts in solvent. Blow out all passages with air hose. 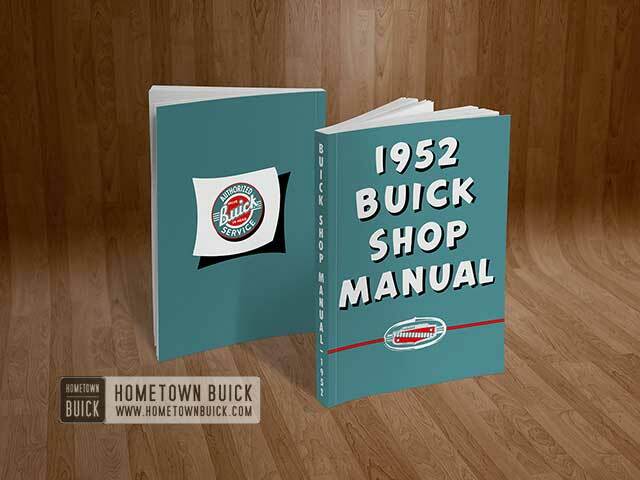 Inspect pump body, 1952 Buick fuel cover, and vacuum cover for cracks, breakage, and distorted flanges. Examine all screw holes for stripped or crossed threads. Replacement of pump assembly is advisable if one of the three main castings is not serviceable. Inspect the rubber pull rod oils seals in pump body. See figure 3-18. If damaged or of doubtful condition, pry out the metal retainer and discard the rubber seal. Place new seal in body with concave side outward, press metal retainer down firmly into body with the flat end of a rod 7/8″ in diameter, then stake body metal in four places around the retainer. Inspect rocker arm for wear or scores at camshaft pad, at point of contact with links, and at pivot hole. Inspect bushing for wear. Replace links if pump has been in service for high mileage. Amount of wear of these ports cannot be determined visually. Replace rocker arm and diaphragm springs, as removed, because old springs may be distorted, weak, or corroded. Insert drilled end of fuel link (short) into link spacer. Place one vacuum link (long) on each side of spacer so that the hooked ends of long links come together. The hooked ends of all links and the projection on link spacer must point as shown in figure 3-16. Line up holes in links and spacer, slide parts between the jaws of rocker arm with flat surface of rocker arm pad facing same direction as link hooks, then install the pin bushing. See figure 3-16. Stand the pump body on the bench, fuel flange down. Set rocker arm spring in body with one end over cone cast into body. Slide rocker arm and link assembly into body, with open end of all link hooks pointing up toward vacuum flange, and engage rocker arm spring with projection on link spacer. Hold parts in body and drive a new rocker arm pin through body and bushing. See figure 3-15. Install a new steel washer over small end of rocker arm pin, support head of pin on a suitable steel block, and peen the small end of pin to retain washer and pin in place. NOTE: Always install the fuel diaphragm and cover before the vacuum diaphragm and cover. Soak 1952 Buick fuel diaphragm in clean kerosene or fuel oil. Place diaphragm spring on oil seal retainer in body, place cup shaped spring retainer on top of spring, then push diaphragm pull rod through these parts with flat of rod at 90 degrees to links in body. Hook pull rod to the short, center fuel link. Place a new valve gasket in each valve seat in fuel cover. Place one valve in seat nearest the inlet port with the spring cage side facing up. Place another valve in the outlet valve seat with the spring cage side down. See figure 3-17. On Type DG (Series 40-50) pump press valves down firmly against gaskets then stake cover metal in four places around each valve. On Type DH (Series 70) pump place retainer over valves with humped side up and install retainer screw. See figure 3-17. On Type DG pump, install fuel screen, gasket, and plug in fuel cover. On Type DH pump, install fuel screen, bowl gasket, bowl, and screw with gasket on fuel cover and tighten screw securely. A diaphragm gasket (not used in factory assembly) is included in each repair kit. Its purpose is to compensate for slight warpage of the fuel cover flange that may occur in service. Place this gasket on the fuel diaphragm and align all screw holes in gasket, diaphragm, and pump body. Do not use shellac or sealing compound. CAUTION: Diaphragm must be held in flexed position until all screws are tightened, otherwise diaphragm may be stretched too tight and cause pump to deliver excess pressure. Soak vacuum diaphragm in clean kerosene or fuel oil. Place a new valve gasket in each valve seat in vacuum cover. Place one valve in seat nearest inlet port with the spring cage side facing up. Place another valve in the outlet valve seat with the spring cage side down. Press valves down firmly against gaskets, then stake cover metal in four places around each valve. See figure 3-18. Install gasket and valve, with spring cage side down, in seat farthest from mounting flange in pump body, then stake in place. See figure 3-18. Do not install the inlet valve adjacent to mounting flange at this time. Hold vacuum diaphragm so that the ear is toward rocker arm and flat on pull rod is at 90 degrees to links as pull rod is pushed through oil seal in pump body. Use a wrench on rocker arm to position inner ends of the two vacuum links about 1/2 inch below oil seal and hook slotted end of pull rod over both vacuum links. Depress rocker arm and insert hooked end of Diaphragm Flexing Tool No. PT-8 (AC) between rocker arm and the stop boss in body, then release rocker arm. The vacuum diaphragm will then be in a flat or level position. If Tool No. PT-8 is not available, a piece of metal having a short bent end 3/32 inch thick may be used. See figure 3-19. Lift ear of diaphragm at rocker arm and install a valve in valve seat in body. Do not use a gasket or stake this valve in place as it is retained and sealed by the diaphragm. Place spring retainer over the riveted end of diaphragm pull rod, place diaphragm spring on the retainer, then place vacuum cover over the spring. With projection of vacuum cover placed toward rocker arm, install two 10-32x11f2″ screws in diametrically opposite screw holes (fig. 3-14) and alternately turn screws down until snug. CAUTION: As cover is installed make certain that diaphragm is centralized. If diaphragm is pulled to one side it will cause the diaphragm spring to rub on cover and produce a squeak during pump operation. Install regular screws and turn down until heads just engage the lockwashers. Remove long screws and install short ones. Be sure that screws pass through holes in fabric of diaphragm without chewing. Tighten all cover screws alternately on diametrically opposite sides, turning each screw several turns at a time, until all are securely tightened. Bench tests of the fuel and vacuum sections of the pump require equipment which is not available in service stations; therefore, tests must be made after installation of pump assembly on an engine. Test fuel section of pump as described in paragraph 3-15. Test vacuum section of pump as described in paragraph 3-16.